International Exchanges: Modern Art and St Ives 1915–1965 explores the wider national and international contexts which shaped art in St Ives in the 1940s, 1950s and 60s. As part of a series of exhibitions exploring the histories and legacies of art in St Ives leading up to the opening of the new display galleries in 2017, the exhibition positions St Ives art within wider aesthetic concerns and broader critical perspectives than the more familiar ideas of landscape and place that shape our view of the artists colony. The exhibition will show how the art of post-war St Ives drew upon two trajectories of modern art: one the utopian ideals of constructivism from Moscow in the 1910s through Berlin and Paris between the wars; and the other a tradition of craft and the handmade that unites the carvings of Brancusi and the ceramics of Bernard Leach and others. 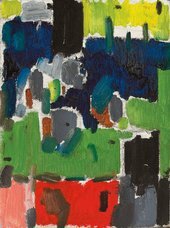 Major works by Peter Lanyon, Patrick Heron and others will also been seen alongside that of their contemporaries from elsewhere in Europe, North America and beyond to position their art within wider formal, technical and philosophical debates. The exhibition will include significant loans from public and private collections in the UK and abroad. In re-evaluating particular dialogues between these key British modernists and their contemporaries in Europe, North America and Japan, the aim is not to disregard the commonly held importance of the location and artistic network of St Ives, but to situate artists’ engagement with that place within wider, global artistic and aesthetic concerns. The project will be led by Chris Stephens, Lead Curator of Modern British Art at Tate Britain and curated by Sara Matson, Curator at Tate St Ives and Rachel Smith, Doctoral Student, Tate Research Centre for Creative Communities. It will be accompanied by an illustrated catalogue published by Tate St Ives and a series of Tate Papers published in association with Tate’s Research Centre for Creative Communities. Organised in collaboration with Mima.